they have a parent in the armed services. provide out-of-school activities which will benefit the child. do not have opportunities outside of school to take part in high-quality enrichment experiences because of low interest, low aspirations or low income. subsiside some enrichment opportunities and activities, including arts and music education. 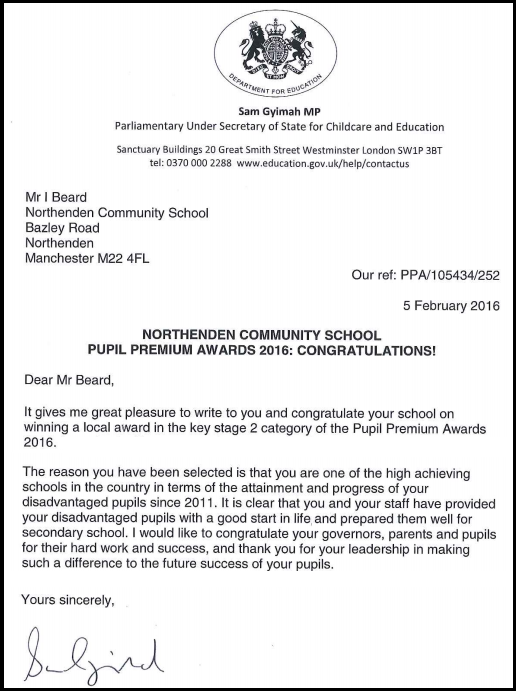 In February 2016, we received a local Pupil Premium award from the Government. Here is an extract of the letter we received from the Department for Education. Given the relatively low numbers of pupils entitled to Pupil Premium, the outcomes, in terms of percentage statistics, need to considered carefully. 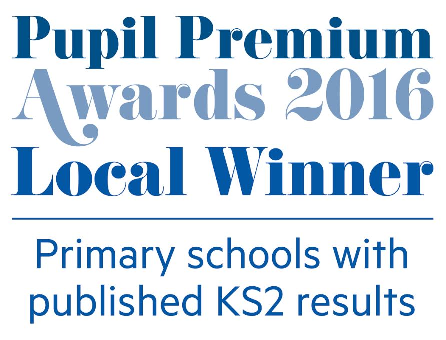 For example, in a class with just two pupils entitled to Pupil Premium funding, it is possible that one child achieves the expected level in all of reading, writing and mathematics and one child (perhaps who also has special educational needs) does not. Our pupil premium outcomes would therefore be 50% (of all disadvantaged pupils) which would seem poor compared to a national figure or the number of pupils who are not disadvantaged.